No, this isn’t actually our fibre, but it’s getting close! This is a roll of sub-ducting, which goes inside the bigger ducting that the team with the mini-digger has been laying under the verge of Holwell Lane this past few weeks. When the sub-ducting is in place, our fibre is ‘blown’ (yes! by compressed air) up the sub-ducting to our cabinets on Main Street. The mini-digger team should complete their works by the end of this week and sub-ducting is already being laid, hopefully to finish next week. The fibre spine up Scalford Road is already in place, so it shouldn’t be too long before we get our fibre! I’ll keep you posted. Ducting has now been laid underground in the road verge along Holwell Lane, from its junction with Scalford Road up to the cattlegrid by the Scouts campsite. The contractors have done a neat job (above) and the grass will grow back quickly. There was a pause in the works to allow BT to negotiate with the farmer landowner for the remaining run in to Holwell village. The work will recommence in a couple of weeks and should be finished in a similar time frame. Thereafter, the fibre itself has to be threaded along the ducting and connected to our cabinets on Main Street. BT remain keen to get us live on fibre broadband as soon as possible. Another consideration is the underground high pressure gas main which crosses underneath Holwell Lane just by the other cattlegrid nearest to the road bridge over the old mineral rail line. Obviously the ducting contractors have to be careful around the gas main! Its location is marked by a pipeline market post (below); those of us in the village about a decade ago might remember the gas main being laid. Contractors are now digging in the first kilometre or so of ducting along Holwell Lane, starting at the Scalford Road junction. Ducting is what our broadband fibre will be laid along. This first ducting job will stop at the Mining Zone, then another job will connect up to the broadband cabinets at the bottom end of Main Street. Thanks for following this site in 2015 – best wishes to you and all in Holwell for 2016. If you’re interested, the WordPress.com stats helper monkeys prepared a 2015 annual report for this blog. Cabinets ready for the New Year! Since our cabinets were stood earlier this month, two teams of engineers have been doing further work on them, connecting our existing copper cables. The site has also been tidied up considerably, with topsoil laid and grass-seeded, so the verge will return to green in due course. So we’re ready for the fibre to be brought into the village, sometime yet to be confirmed, hopefully early next year. It has been suggested to me that it won’t come (as I originally thought) from Scalford Road, but from Nottingham Road. 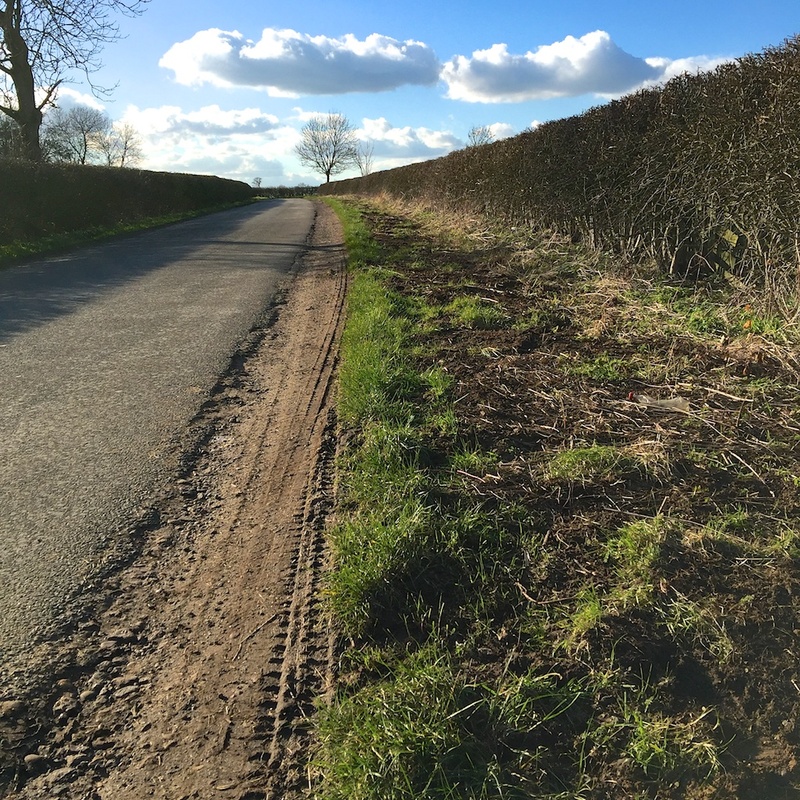 This makes sense as we know fibre is already in Ab Kettleby, which is closer to us than Scalford and there is existing ducting along Nursery Lane and Main Street – it’s easy to follow the Telecom manhole covers. Thank you for following this blog in 2015 – Happy Christmas and best wishes for a (Superfast Broadband) New Year! The PCP has now joined the DSLAM, down at the lower end of Main Street. Although the site has been cleared of spoil, there’s still some work to do to remove the larger stones and seed for grass, so that in due course the verge will look nice and green again. There has been some more work done on the cabinets since they were stood, such as electrically earthing them, but the main job we’re waiting on is digging in the fibre from (I think) Scalford Road. I have no date from BT or LCC on when that will be started, but have been told it will be in the New Year. I can see that Scalford has yet to get its 2nd cabinet and work will be under way soon to clear some duct blockages along Scalford Road, so the project is still progressing our way. Meanwhile, thank you to all in the village for participating in my latest survey and I’m pleased to report that nearly everyone is likely to upgrade to fibre broadband when we go live. I’ve shared that information (in aggregate only, no personal details at all) with BT and LCC to encourage them to connect us as soon as possible. I’ll keep you posted on developments here. Happy Christmas and best wishes to you all for New Year! The first of the two cabinets we need for our fibre broadband has been stood, down at the bottom end of Main Street. This cabinet is called a DSLAM – a Digital Subscriber Line Access Multiplexer – and is what our telephone lines will hook up into. The second cabinet – a PCP (Primary cross Connection Point) – should be stood alongside the DSLAM in the next few days and is what the fibre connects to. The fibre itself isn’t here yet and has to be laid into the village from Scalford Road way. I’ll keep you posted on developments!